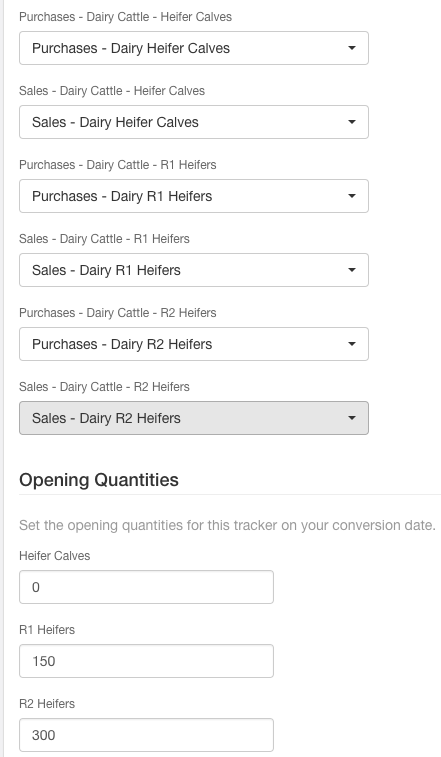 You can have as many livestock trackers as you wish, provided you have either a unique set of sales / purchase accounts setup or multi-farm enabled. In your main Operations tab, hit New operation tracker and on the following page select your desired livestock type i.e. dairy cattle from the list provided. To create a new livestock tracker, you'll need to enter a name and the desired account mapping. If you have enabled multi-farm, you'll see an additional option to choose which tracking option the tracker is assigned to. NOTE: Single purchase and sale account mapping means you have one sales and purchase accounts for all of your stock classes i.e. Dairy Cattle - Sales. Individual purchase and sale account mapping means you have a unique sales and purchase account for each stock class i.e. Bobby Calves - Sales, MA Cows - Sales. On creation you'll be taken to the livestock tracker settings page, you can get back to this page at any stage by going to Production > Livestock tracker > Tracker settings. 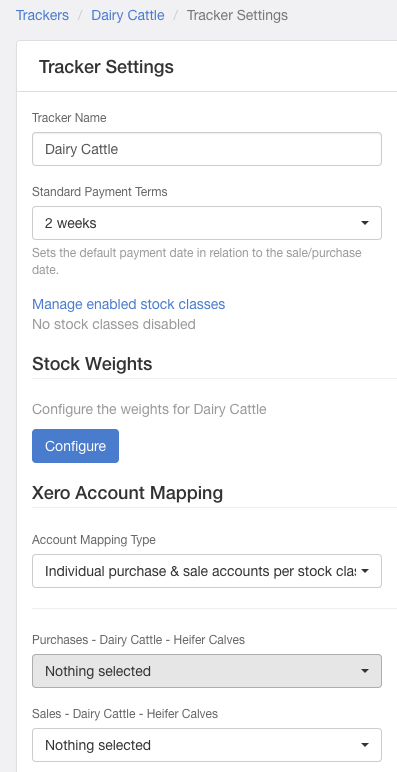 Here you can update the standard payment terms (defaulted to 2 weeks), stock weights, enabled stock classes, Xero account mapping, and opening balances. 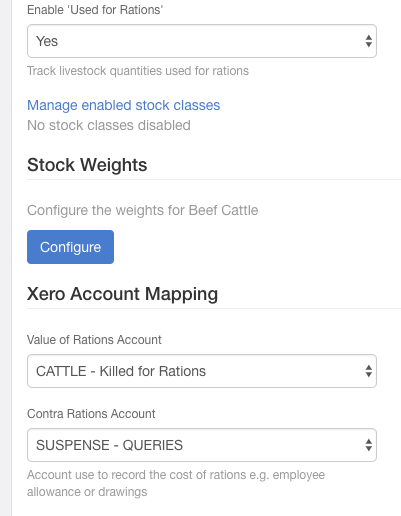 NOTE: New Zealand and Australian livestock trackers have an additional option to enable rations and map a rations and contra of rations accounts. We recommend you manage enabled stock classes first, and then map your sales / purchase accounts second. 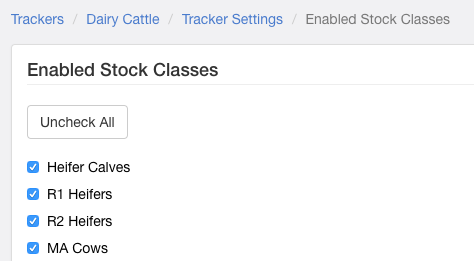 Managing enabled stock classes allows you to disable the default stock classes shown in all production trackers, this will mean your stock rec is easier to keep on top of. 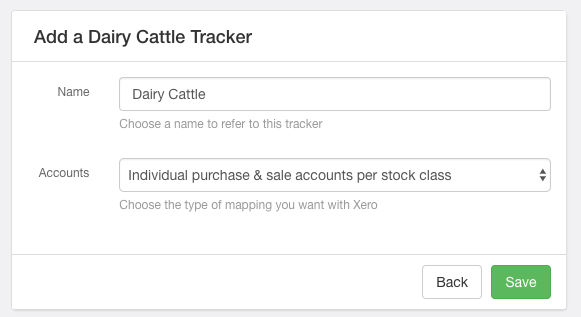 Once you've disabled unneeded stock classes, you can map your sales and purchase accounts and then set the opening balances for each stock class. Once you're happy with the setup, hit Save changes at the bottom of the tracker.